Result: Glamorgan 302-6 (Cooke 80, Donald 53, Wagg 52; Briggs 2-45) beat Sussex 218 (Wright 65; Hogan 4-41) by 84 runs. Not even the battling heroics of Sussex captain Luke Wright could prevent red-hot Glamorgan rumbling on to another triumph. The Welsh county now have four wins in their past five matches in white-ball cricket, a stark contrast to their poor form in the four-day competition in early season and a streak ignited largely by their younger players. It seems the change in format(s) has breathed life into Glamorgan’s young guns, with the exciting talents of Chris Cooke, Aneurin Donald and Craig Meschede at the forefront of this victory. 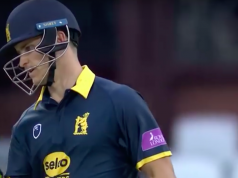 Another talented young buck, Timm van der Gugten, was rested for this Royal London One-Day Cup match, with Head Coach Robert Croft keeping one eye on Friday night’s match versus Gloucestershire in the T20 Blast. But Cooke’s 80 off 67 balls, in partnership with Graham Wagg (52 off 37 balls), was the cornerstone on which this success was built. The South African-born batsman has called Cardiff his home for nearly six years now and he is hugely popular among fans. It was easy to see why, as Cooke made hay after a circumspect start in which he and Donald (53) assembled Glamorgan to a decent platform. Donald was then pinned LBW by Danny Briggs, which brought Wagg to the crease to wield his bat with devastating consequences. He and Cooke put on 112 for the fifth wicket, to boost an innings that had petered along until around the 40th over. Glamorgan had lost David Lloyd early, caught at slip by Chris Jordan off Steve Magoffin. They then lost captain Jacques Rudolph – to injury rather than dismissal. The South African was struck on the forearm and experienced heavy bruising, which is not thought to be too serious. He should return for Friday’s T20. 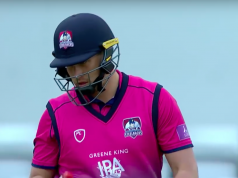 Will Bragg continued his form, after smashing 75 against Gloucestershire on Monday, hitting 42 this time before misjudging a Briggs quicker-ball which skimmed the off pole. Then came the first partnership, between Donald and Cooke. But the fireworks were saved for the final 10 overs when Cooke and Wagg found every corner of The SSE SWALEC. The fans who came to the sun-soaked stadium, hoping for another Glamorgan win had their hopes boosted immeasurably when 67 runs were stolen off the last five overs. Ajmal Shahzad conceded 22 off one, and Jordan failed to find his customary yorkers in conceding 17 off another. 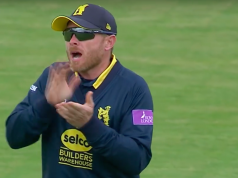 Cooke’s dismissive slaps through extra cover and Wagg’s flat-batted square-leg sixes gave the crowd more to cheer before both batsmen fell in the final eight balls. Even then, Andrew Salter and Meschede struck a boundary each to ensure Glamorgan got past 300. A score of 302 was always going to be difficult and when Chris Nash was run out, Ed Joyce perished in the deep and Ross Taylor was brilliantly caught and bowled by Meschede, it looked enormously unlikely. But you should never write off Luke. The Sharks captain wasn’t going to die wondering and counter-punched with an excellent 65 before being outstandingly caught at mid-on by a back-peddling, diving Colin Ingram. From that moment onwards it was plain-sailing for Glamorgan in the field, save for a couple of skyward slogs from Jordan, who was also well-caught by Donald in the deep for 22. Three superb catches from Glamorgan, in comparison to the five Sussex drops that littered the first innings and allowed Cooke and Wagg to prosper tell the tale. Catches win matches – and Glamorgan win white-ball cricket matches as well, apparently. They’re top of both their T20 Blast and One-Day Cup groups.